Reishi uplifts the spirit and builds protective power, a true Crown Chakra herb. 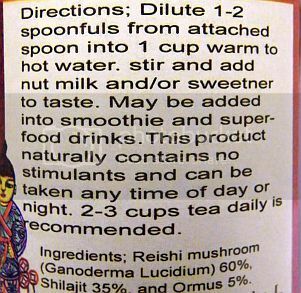 (see front page link for more info on Reishi). Shilajit is a full spectrum nutritional substance from the Himalayan mountains- It is thought to be comprised of broken-down carbons from ancient rain forests, sandwiched between rock strata as the Himalayan mountains were formed 50-100 million years ago, and now in spring, a black substance oozes out between rock strata in the high Himalaya, where it is harvested and dried into a powder. There is a whole pristine eco-system in Shilajit! and it is said to be excellent as a garden soil additive for minerals and plant nutrition. Ormus is an alchemical mixture of semi precious stone silicates washed down from the mountains over eons, ground into fine clay-like sediments on ocean beds and eventually found in thin veins deep in the earth. At its base, ormus is thought to contain elemental alchemical substances that form precursors of both gold and crystal, quite fascinating! It is said that ormus can structure the water in the body, activating extra absorbability of the poweful nutrients and minerals in the Reishi and Shilajit. This is an awesome super food, great in smoothies, or as a hot coffee-like drink. Add a little to your pet's food. 3oz powder in canister. Reishi is widely used in Asia to improve the cardiovascular system. It has been found to prevent and treat hardening of the arteries, angina and shortness of breath associated with coronary heart disease.